Fido to go™ is the first/original dog and cat treat food truck in the nation, serving handmade specialty cookies and frozen yogurts! 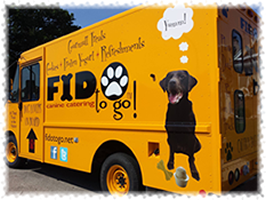 Fido to go™ is Chicagoland's premier gourmutt food trucks serving handmade, gluten and allergen-free canine cookies, doggy ice creams/frozen yogurts, chews, cat treats and more! Our products are made in the United States with only the finest U.S.A. ingredients and are egg free, corn free, gluten free, grain free, soy free, sugar free, no additives or preservatives. Find us out and about with both trucks named, Maddie & Jak on Chicagoland streets, dog parks, beaches and special events. Make sure to follow us on Facebook and Instagram to find our locations or check our calendar on this page. Fido to go™ is often copied but never duplicated!